Thomas Lyle Flick (born August 30, 1958) is a former American football quarterback. He was drafted by the Washington Redskins in the 4th round of the 1981 NFL Draft. A 6'3", 190 lbs. record-setting quarterback from the University of Washington, Flick played in seven NFL seasons from 1981-1987. He currently works as a corporate speaker on leadership and change. Raised in Bellevue, Washington, Flick attended Interlake High School where he played football, basketball, and baseball. As the starting quarterback in his junior year, Flick led the Interlake Saints to 10-0 season in which they won the Kingco Championship and were ranked #2 in the state of Washington. Leading the Saints to a repeat appearance in the Kingco Championship in his senior season, Flick was recruited by many top colleges, ultimately accepting a scholarship to attend the University of Washington playing for legendary Husky coach Don James. As quarterback, Flick led the Huskies to two post-season bowl games, the 1979 Sun Bowl and 1981 Rose Bowl. While leading the Huskies to a 9-2 record and winning the 1980 Pac-10 Championship, Flick set several records including most passing yards in a single season (2,460) and longest touchdown pass (84 yards to Willie Rosborough against Air Force). Known for his accuracy, Flick set a record in 1980 for career passing percentage (60.4%), including a game against Arizona where he earned a record for the highest single game passing percentage, completing 16 of 17 passes and 3 touchdowns while suffering from a concussion. During his senior season at UW, Flick was voted Team Captain and Most Inspirational by his teammates. 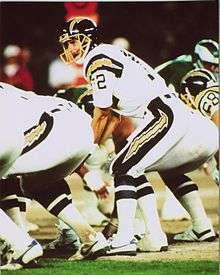 Flick was chosen to play in two all-star games in 1981, the East-West Shrine Game and Japan Bowl, as the starting quarterback. Flick was drafted in 1981 by the Washington Redskins as the 7th pick in the 4th round. As the third quarterback taken in the NFL draft that year, Flick was hand-picked by Coach Joe Gibbs in his first season as head coach of the Redskins. Traded to the New England Patriots, Flick continued his seven-year NFL career playing for the Cleveland Browns, San Diego Chargers, and New York Jets. Flick saw his most playing time in San Diego as backup quarterback to NFL great Dan Fouts, earning MVP game honors by completing 16 of 22 passes against the Super Bowl-bound Denver Broncos in 1986. Known for his leadership skills during his career as a quarterback, Flick transitioned into the realm of inspirational speaking. Founding Tom Flick Communications in 1989, Flick started off by speaking to educational systems. An expert on leadership and change, Flick has traveled throughout North America and internationally to deliver thousands of keynotes and custom presentations to countless organizations. Clients include Microsoft, Starbucks, Hallmark, Boeing, American Express, NASA, Ritz Carlton Hotels, and the Pentagon. Flick was mentored by leadership and change expert Dennis Goin, Executive Vice President of Kotter International. Flick has an alliance with Kotter International, founded by Konosuke Matsushita Professor of Leadership, Emeritus at the Harvard Business School and Chief Innovation Officer, Dr. John Kotter. Married since 1985, Tom and his wife, Molly, have two children, Jenny and Joe. He currently resides in Redmond, Washington.